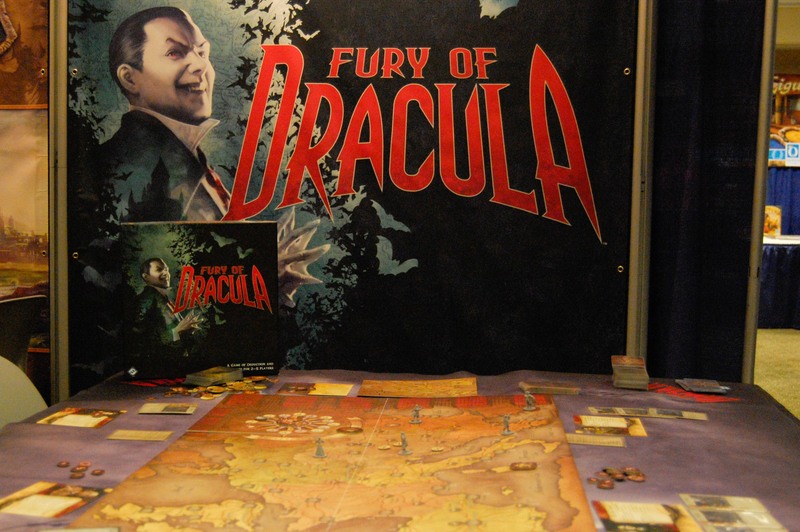 One of the harder demo tables to grab a seat at in the exhibitor hall was Fantasy Flight Games' Fury of Dracula, the newly-released third edition of a beloved classic. Originally released back in 1987, Fury of Dracula is one of few games to effectively implement the concept of hidden movement (See: Scotland Yard, Mr. Jack), and is highly sought after for its reputation. For this new edition, the staff at FFG stripped Fury of Dracula down before building it back up with a restructured combat system and a new mechanic that allows Dracula to cast misdirections. The artwork and graphic design has also been completely redone, making this re-release the definitive edition. Most gamers are simply happy to no longer pay eBay prices for this "grail game," so a slate of positive changes is icing on the cake. Fury of Dracula is available now at game stores, and direct from Fantasy Flight.